Cyclists in the City: TfL talks of 'equality on the road for cycling' but its 'current useless traffic models' don't count cycling as equal and risk killing people. TfL talks of 'equality on the road for cycling' but its 'current useless traffic models' don't count cycling as equal and risk killing people. My post this week about how cyclists might react to the latest developments at Blackfriars triggered a flurry of responses. I want to thank everyone who's commented on those thoughts about how people who cycle can get the message across about Blackfriars junction. What's becoming clearer to me is that a lot of people are increasingly fed up of the Mayor's policy of increasing speeds for people in motor vehicles to the detriment of people who cycle and walk. As War on the Motorist blog puts it, Londoners are finding their way towards serious and significant protest on these points. Even here, says the blog, 'big things are beginning'. And those issues are becoming mainstream. What hasn't yet reached the mainstream are the technical issues that sustain Transport for London's insistence on 'smoothing the traffic flow'. Some new developments this week make those issues much much more relevant. 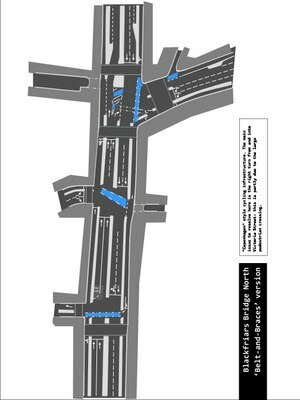 Transport for London has been responding to freedom of information requests about the traffic models behind the Blackfriars junction. In May, TfL stated that "the complexity of the design has meant that all road users have had to be considered with equal weighting". In which case, you might think, Transport for London might have developed a bridge scheme that looked something more like this scheme on the left, rather than the high-speed motorway it is building instead. Something like this would give space for all sorts of people to safely get through the junction with equal weighting. Cyclists would be able to turn right into Queen Victoria Street (heading north) or on to Victoria Embankment (heading south) safely, without having to filter across what will soon be three lanes of fast-moving motor traffic. That is something I'd understand as equality on the road. So it's very revealing to see another FOI response sent by Transport for London to a fellow cyclist this week. This response explains the 'traffic modelling information' used for Blackfriars. And although we're still waiting to see a few more bits of the data (arriving by CD in the post, no less), everything suggests that Transport for London has used a traffic planning scheme at Blackfriars that defines one cycle as only 20% of a car. Yes, when you're on your cycle, you count as 0.2 PCUs, or 20% of a Passenger Car Unit. Assuming we've understood correctly, Transport for London may know the traffic modelling tool it has used here may not meet its legal obligations. That's because ""Where the volume of cyclists exceeds approximately 20% of the traffic volume on any one approach [remember, cycles represent 37% of traffic in the rush-hours here] they may have a disproportional effect on modelling results and their influence may need further attention. For this reason it is encouraged to ensure classified traffic surveys explicitly include cyclists." Val Shawcross, Labour Assembly Member, has tried again and again to ask the Mayor whether the traffic models at Blackfriars 'explicitly included cyclists'. Strangely enough, Transport for London hasn't responded to her questions yet. So, I asked the question of Andrew Boff, Conservative Party Assembly Member. His comment: "The data [at Blackfriars] isn't terribly good....we just didn't have the data." It seems that everyone involved with Blackfriars knows something that Transport for London isn't admitting. If they're right, then Transport for London is selling us a scheme at Blackfriars that gives each person on a cycle utterly unequal weighting to a person in a motor vehicle. Put bluntly, if all these indications are correct, then TfL appears to be actively prejudicing against people if they are on a cycle rather than in a motor vehicle. That is simply wrong. Last week I quoted Andrew Boff on this one point, when he told me: "[The broader issue] is that it's not just about recognising the [private motor vehicle] capacity of the road any more. It's about the thought that goes into the people using that junction, it's about how people use that junction." He's absolutely right. And this is exactly what TfL is not doing, by all accounts. "I can't see anything changing with TfL until they change their view on what their network management duty involves, i.e., that the expeditious movement of traffic doesn't mean expediting motor vehicle traffic, it means expediting the movement of all traffic, including pedestrians and cyclists. That in turn won't change until they have traffic models that can cope with the more fine-grained, less predictable movements of pedestrians and cyclists rather than ploughing on with their current useless traffic models on the basis that that's all they have." Everyone who knows what's really going on here is starting to say the same thing, namely that Transport for London's models don't count cycling and pedestrians properly. The Mayor's agenda for smoothing the traffic flow is therefore deeply flawed. And it is people on cycles or walking who will be dangerously exposed on London's roads as a result. Labour is hinting loudly that they know this, the Greens likewise. The LibDems are stating it blatantly, the Conservatives are starting to do the same. The AA President acknowledges it. TfL's own data is now revealing the reality and traffic engineers close to the Blackfriars scheme are starting to break ranks with the official Transport for London line. I said a few weeks ago that "TfL is the enemy". I think that's true. There are plenty of good and competent people at TfL but everyone who knows what's going on at Blackfriars seems to suggest there's something going deeply wrong with 'smoothing the traffic flow'. The results are no laughing matter. As more and more people in London take to cycling, it wouldn't be too much of an exaggeration to say that TfL's traffic models are killing people. Assigning cyclists a value of 0.2 versus 1 for a car positively reflects their efficiency at junctions in terms of Passenger Car Units - you can get five bikes through a junction for every car. "The Mayor's agenda for smoothing the traffic flow is therefore deeply flawed." Given that the mayor is also deeply flawed, this should come as no surprise. So now we have the answer to Val Shawcross’s question. TfL didn’t assess the new road layouts at Blackfriars to see the possible impact of motor vehicle behaviour on cyclists because their software can’t do it. They could only have ‘explicity included cyclists’ in order to ‘model their effect on other motorised road users’. As long as the the majority i.e. the cyclists don’t delay the minority i.e. the cars then as far as TfL are concerned everything is okay. Given the number of cars carrying 1 person, a bicycle must be an equal, same person moving stats. Are we 1/52th of a bus? You can prove anything with statistics, 98% of the population know that! It is important to remember that the PCU value is a "capacity" measure rather than a "value" measure - the PCU value of bicycles depends on lane width (with wider lanes having a lower PCU because other traffic can pass cycles easier and vice versa) according to this Colin Buchanan report, which also notes that "In most cases, the Directorate of Transport Operations (DTO), part of TfL, advises excluding two-wheelers from micro-simulation models." In theory a bus full of passengers is more efficient than the same number of cyclists as far as PCU values go, as 52 times 0.2 is more than the PCU for a bus (2.5). In practice this may not be as clear cut as the bus may (in addition to not being anywhere near full), for example, have to wait at a green traffic light to avoid blocking a box junction whereas many of the cyclists would have gone though and filtered past the queue on the other side. Also the bus will block traffic behind it at bus stops, whereas a cyclist who stops will probably move onto the pavement on busy roads. There are of course, economic models that we may find objectionable when it comes to determining the economic worth of new transport infrastructure. The thing to do here is to point out that cycling has the highest ROI of any mode in terms of investment. @Iainecg - I think it is essential that London's major arterial routes such as the A4 and A40 have separate cycle tracks, as the current situation of convoluted back street LCN routes is rather poor (no-one would build a road without a pavement and sign an alternate pedestrian route, would they?). We need to move to "Degrees of Separation" with faster, busier roads (or near permanently congested ones) having more separation between cycles and motor traffic. Which I think is completely illogical, as we know that wider roads encourage drivers to increase speed. It also suggests that TfL think speed limits are useful only to reduce the risk of cars crashing into one another, rather than as a means of creating a more humane and pedestrian/cyclist friendly environment. Slightly off-topic: That 'Dutch-style' design for the Blackfriars North junction is very interesting, but it's not very clear from the diagram how it joins up to the roads around it. I wonder if the person who produced it could do a sort of 'zommed out' view to show the design in context, or overlaid on a map of that area, or the existing junction? fashion blog are the best.I love reading it because it keep me up to date with latest fashion trends.I loved all your fashion advice.As a commercial photography student i find your blog very helpful.